What happens at a Journey To Authenticity workshop? In June, I facilitated the second Journey To Authenticity workshop for 2017. It was another experience that I feel blessed to have been a part of. A new group of people brought with them, a very powerfully unique expression of authenticity and connection. 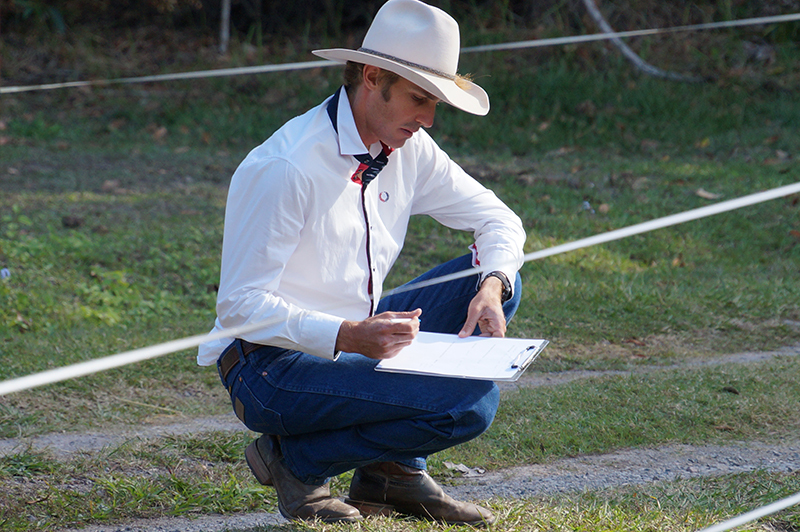 In this article I talk about the activities we experienced on the first day. To describe the lessons and experiences people get out of these workshops is difficult. It is like comparing the difference between Leonardo da Vinci’s Mona Lisa and Michelangelo’s painting of the Sistine Chapel. Both artworks leave you awe struck, but at the same time they are completely unique expressions of art. So, I will try my best to summarise what these lessons and experiences represent. It has been my practise, to commence each day of the workshop with a mandala. Mandala is a Sanskrit term from India and Tibet meaning circle. Mandalas are symmetrical geometric designs, usually enclosed within a circle, square, or a rectangle, that serve as Cosmo grams and as focal points for meditation, and have been used by many cultures since before 1,500 BC. The mandalas that I use in my workshops are a form of subjective artwork. They are either drawn or painted by participants and are usually created with a specific meaningful question in mind. The questions that I use for the mandalas are directly related to authenticity. They aim at getting the participants to create a physical representation of what being authentic looks like for them. Once the mandalas are finished, they are given a unique title by each participant, which sums up the subjective meaning of the artwork to them as an individual. This exercise really brought out some powerfully unique representations about authenticity for the participants. It allowed them, to bring the concept of authenticity into a more tangible form, that could be more easily integrated into everyday life. 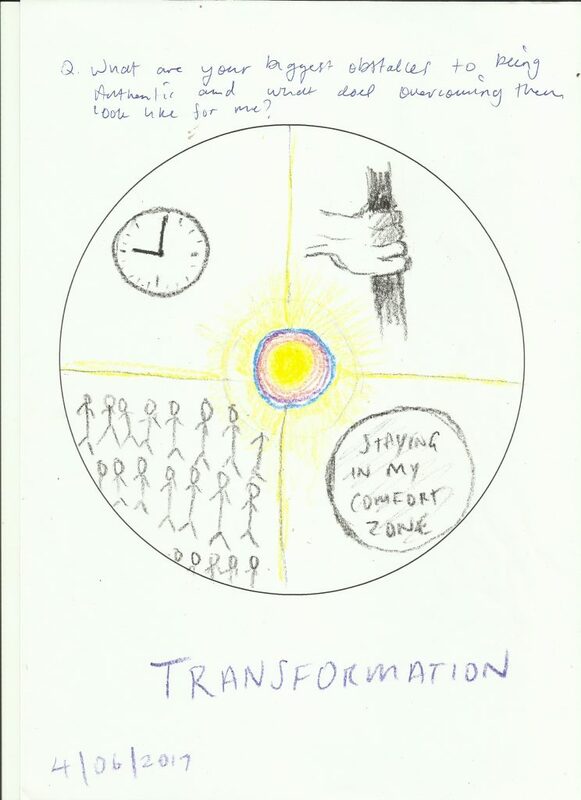 This mandala exercise, set the tone for the workshop and allowed the participants to open a door into their own inner truths, which might otherwise remain closed or unused. The next exercise was the body scan, which is an activity that directs participants to get in touch with all the different sensations and messages within the body. Learning to use the body as a sensing device, that provides important information to enhance body awareness, intuition and insight, is a powerful tool. This exercise paved the way for the participants to start listening to their own body’s messages as a form of intuitive wisdom. The participants stated, that body scans revealed an overwhelming bombardment of sensations and messages from the body. This made it harder for them to listen to and trust what their body was saying. On the other hand, they noticed that once the body’s sensations were listened to and their message interpreted, the sensations often dissolved, diminished or shifted. During the workshop, I explained that the body scan plays a very important role in helping you to be authentic, because it allows you to acknowledge, on a subconscious emotional level, how you truly feel. By doing a body scan you connect the conscious and subconscious aspects of your mind and emotions, which allows you to express your true feelings in a powerfully authentic way. Next, we did the Boundaries and Energy Fields activity. 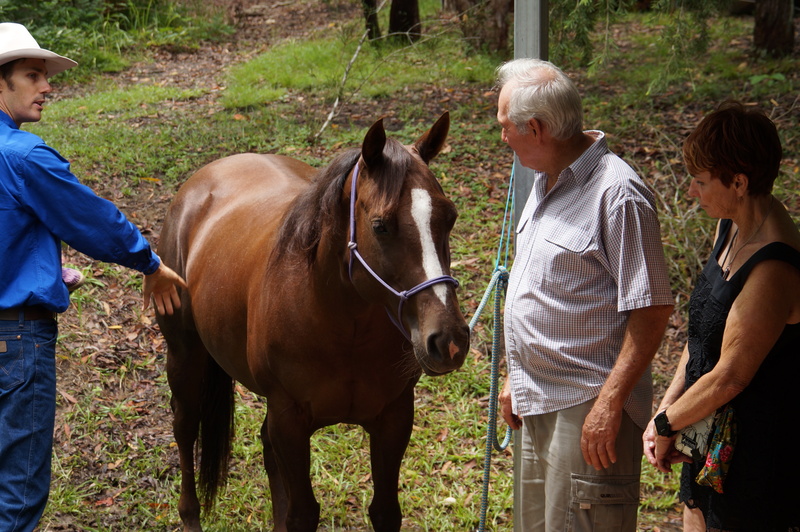 It was, as usual, a very insightful activity with the horses. 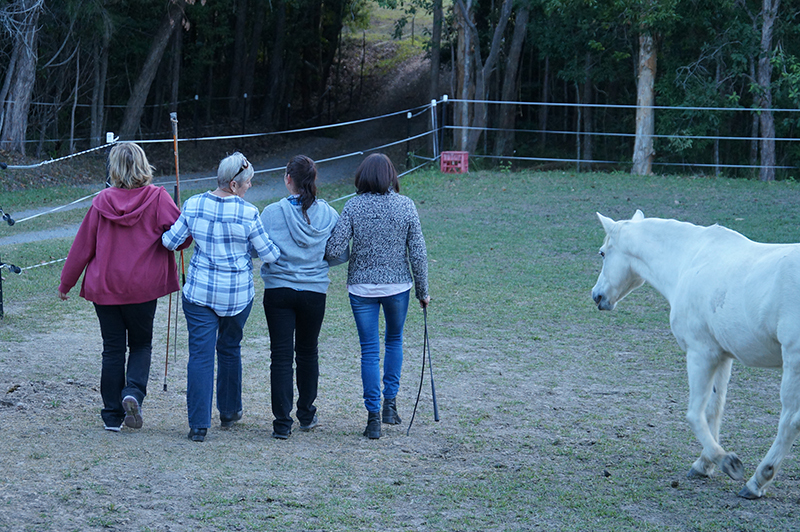 The participants got any opportunity to practise with each other first and experience just how tangible our physical, mental and emotional boundaries can be. The biggest realisation, that took place, was how much we have an involuntary physiological response to someone approaching us from a distance. 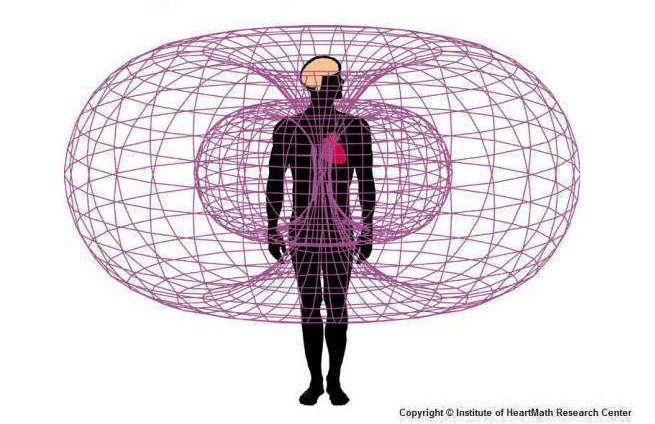 There are tangible electromagnetic energy fields, which are projected out from our heart, that create these sphere’s (or bubbles) around our bodies. The most noticeable of these is the closest layer which is about a 20-30ft diameter around our bodies. This layer is called the layer of connection or engagement, it is where most people will have the most significant involuntary response to someone approaching them. 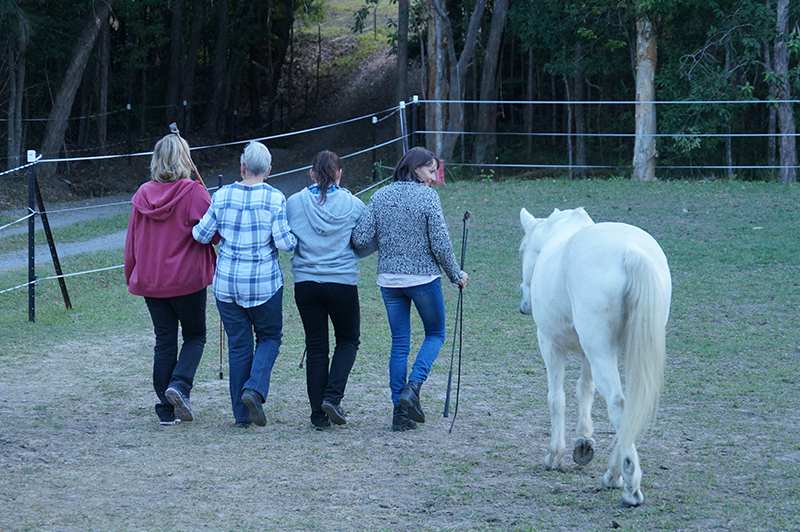 Experiencing this first with each other and then with the horses opened the participants to the awareness and importance of setting mental, emotional and physical boundaries, as well as sensing and respecting the boundaries of others. Learning to become competent at setting your own boundaries and respecting boundaries of others, is an important part of feeling respected and connected in relationships. A functional relationship between two people cannot exist without a mutual understanding of each other’s subjective boundaries. After lunch, the participants were immersed into the Authentic Self vs Conditioned Self activity. This exercise played a big part in assisting them to define what authenticity is for each person individually. It also gave everyone the opportunity to take ownership of their dual nature. This lead to the realisation, that authenticity is about taking ownership of the light and dark sides of the human experience, instead of trying to disown or deny one or the other. By embracing both sides of our nature, we become integrated into a whole being again and the by-product of that is authenticity and self-love. The last activity for the day was Leadership Through Relationship. This activity gave participants an opportunity to experience, how to correctly use their dial of power in a leadership situation to motivate others to engage and follow willingly. 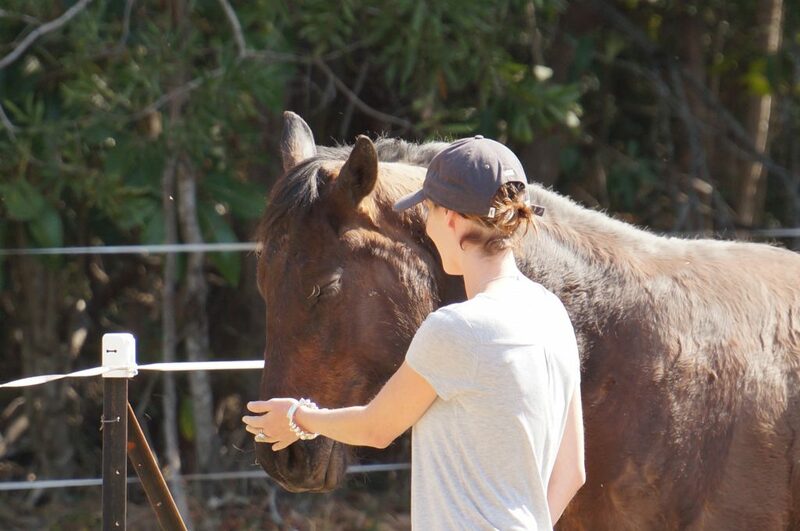 The goal is, to use various steps of motivation to get the horse to follow you freely, without a halter or lead rope, increasing connection and trust as a result. 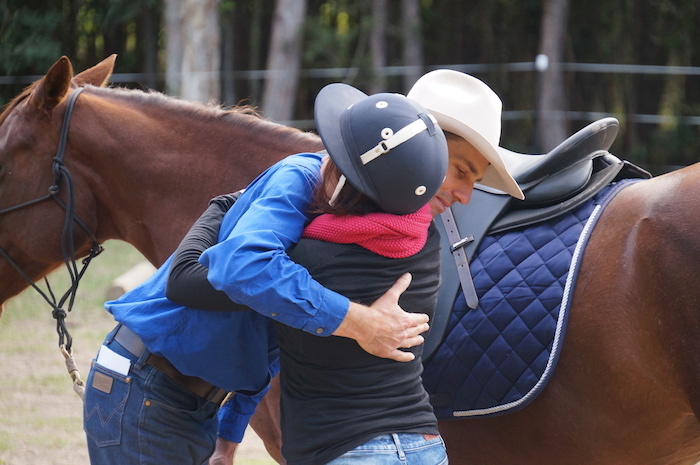 The participants successfully achieved this goal with the horse, by engaging in an effective strategy for utilizing their power in an assertive but compassionate way. 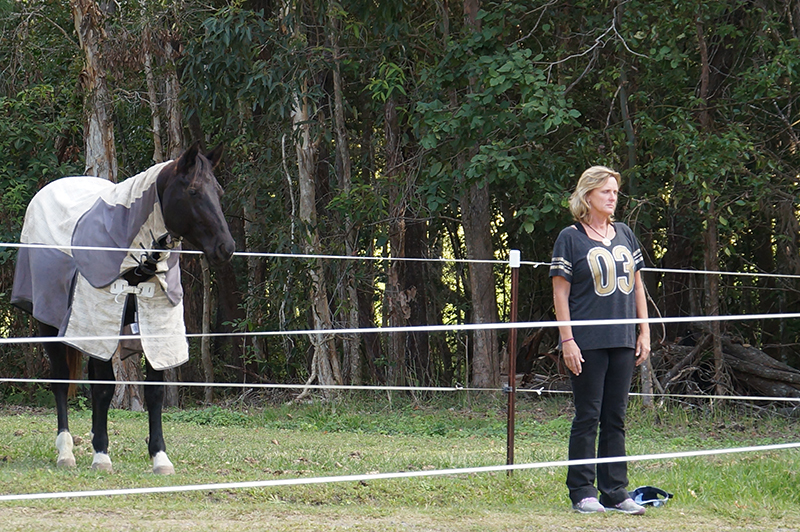 The participants had the opportunity to practise on each other and experience the exercise before practising with the horses. In many ways, the simulation is a vital part of the experiential learning, because it gives the participants first-hand experience of what it’s like to lead and be lead. 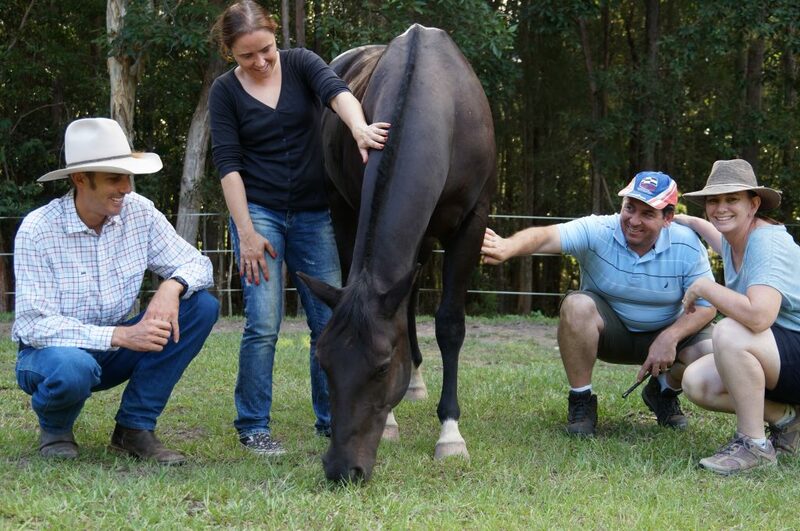 It was very clear through the feedback of the participants, that the greatest challenge for them was to make yourself engaging enough to capture the horse’s attention and then to keep it. Embodying the non-verbal energy of soft engagement, assertiveness and compassion all in one, required a delicate balance to be effective. But successfully embodying all three of these elements lead the participants to experience the essence of true leadership, which is leading by example. By the end of the first day, we had all been on the rollercoaster ride of the highs and lows that come with personal growth. We laughed, we cried and deep down we felt a sense of gratitude for the experiences we shared. Most importantly we had fun along the way. I am really surprised at how much I gained from this workshop as I went in there not really knowing what I was looking for or what I might gain. I learned strategies and insights that have given me strength and a belief in myself that I have begun to act upon straight away. Ben is an excellent facilitator. He has a gentle but quiet strength of character and an understanding of struggle through his own experiences. He is accepting, warm and kind. In the next two post, I will be sharing more photos of the June workshop and elaborate on and share details about the exercises and activities of the second day. So, stay up to date by joining our newsletter. Our next Journey To Authenticity workshop is in Septmeber. Click here for more details.